Suwattana Garden. 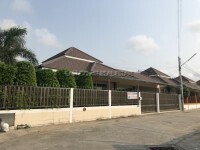 Inside this very secure village approximately 10 minutes from the centre of the city is this Thai/Balinese villa. This house has some unique styling features like high vault ceilings, large pillars, and full glass windows with ready make this house stand out from the rest. All the rooms are very large, and the living room walks out to the private swimming pool area. The house has a European and Thai kitchen, plus a maids quarters.